BANGKOK – August 31, 2018 - Food is where it all (life, love, laughter and longevity) begins at Six Senses Hotels Resorts Spas. The culinary and spa teams grow it, forage for it, source it, prepare it, cook it up, and blend it into spa treatments and therapies. It has a direct bearing on guest health, vitality and happiness - and that of the world around them - which is why Six Senses ensures all produce is local, seasonable and sustainable where possible. The group's philosophy on food and drink starts with choosing natural ingredients and a cleaner and simpler approach to preparation, focusing on quality, balance and fresh whole food made from scratch. Herbs, fruit, veggies and mushrooms are grown in the organic gardens on site. Fresh eggs and milk are also supplied by resident chickens, goats ... and even camels. Six Senses adheres to the highest ethical standards on caring for livestock, follows a “no-take” list of at-risk seafood species, and is committed to local and seasonal sourcing of produce. All properties are building close relationships with local farmers and suppliers, who share the same commitment to responsible sourcing and seasonality. Several properties are also active in local farmers’ markets; Six Senses Samui even hosts their own for the local community and guests several times throughout the year. Knowing that one third of the food we consume requires pollination by bees, honey bee farms are maintained onsite to support healthy ecosystems and provide fresh honey. The attitude is also about less is more, with chefs cooking up feasts while avoiding additives, preservatives, artificial colors and flavors or GMO foods. Plastic bottles are out. Instead, each property treats, purifies, mineralizes and bottles its own still and sparkling drinking water in reusable glass bottles on site. 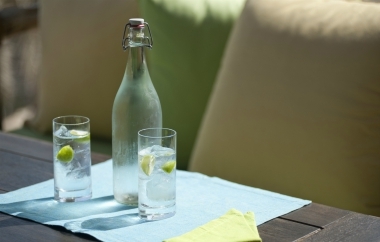 Six Senses water is provided on a complimentary basis in all guest accommodations. Chilled water, sparkling and still, is served in restaurants at a cost that is significantly less than imported bottled water, with 50 percent of all sales contributing to the Sustainability Fund. The money is earmarked for use in local community projects. "We surveyed many guests across all of our properties and held blind taste tastings of Six Senses water," said the group's Vice President of Sustainability Jeffery Smith. "Many people were not able to distinguish between branded water and Six Senses water. And once the environmental implication was made clear, the overwhelming consensus was one of full support for the initiative." 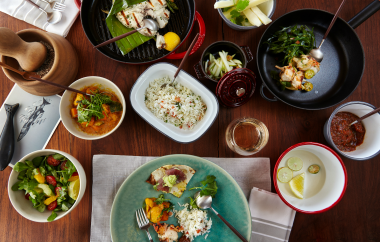 Guests taking advantage of one of the many wellness programs at Six Senses will also be fully supported by the culinary teams, who can adapt meal plans to individual needs. For example, the Trim & Fit program reduces fat mass through a balance of quality protein, resistant starches and healthy ketogenic fats, while limiting carbohydrates (glucose). And the Holistic Anti-Aging Center, which launched in May at Six Senses Kaplankaya in Turkey, is based on an anti-inflammatory approach, using fresh, mineral rich foods that are abundant in antioxidants to fight free radical damage to skin, hair and nails. Due to its popularity the Holistic Anti-Aging Center concept will be launched at sister properties in 2019. To drink to guests' health, many spas incorporate a juice bar serving up house-made probiotics and "living" tonics. These blend up native plants that contain health-giving properties to aid digestion, reduce inflammation and keep the body's immune system strong. An enticing juice and smoothie menu that features local ingredients is also available across the group and complements the personalized wellness programs. Wellness experts share nutritional advice during personal consultations, while cooking classes and the Alchemy Bar workshops teach guests how to use local ingredients and produce in nutritious meal or in homemade hair, body or face masks and scrubs. There is also follow-up advice to take home, so guests understand what foods to favor and avoid, and how to keep up the good work going forward. Corporate Food & Beverage Director Jonathan Heath, who spearheads the ongoing commitment says, "All Six Senses dining outlets focus on using home-grown ingredients, augmented with responsible produce from local farmers and cultivated to our specifications. We continue to serve local and international favorites, but by default, our guests leave feeling better than when they arrived." You are what you eat, so eat well to feel well! Six Senses Hotels Resorts Spas operates 16 hotels and resorts plus 30 spas in 21 countries under the brand names Six Senses, Evason and Six Senses Spas. The portfolio will triple over the next five years with resort, hotel and spa openings underway in Austria, Bhutan, Brazil, Cambodia, China, India, Indonesia, Israel, St. Kitts and Nevis, Singapore, Spain, Switzerland, Taiwan, Thailand and the United States.